The creators of Shaolin Jazz proudly present CAN I KICK IT? – an innovative film experience that pushes the envelope of sound syncing, where we screen classic martial arts movies (including anime) while SHAOLIN JAZZ co-founder DJ 2-Tone Jones spins a creative blend of hip-hop, soul, rock, and more. The result – your movie experience redefined where 2-Tone is creating a live mixtape (sound track) to each movie, even accentuating specific scenes with special DJ techniques. 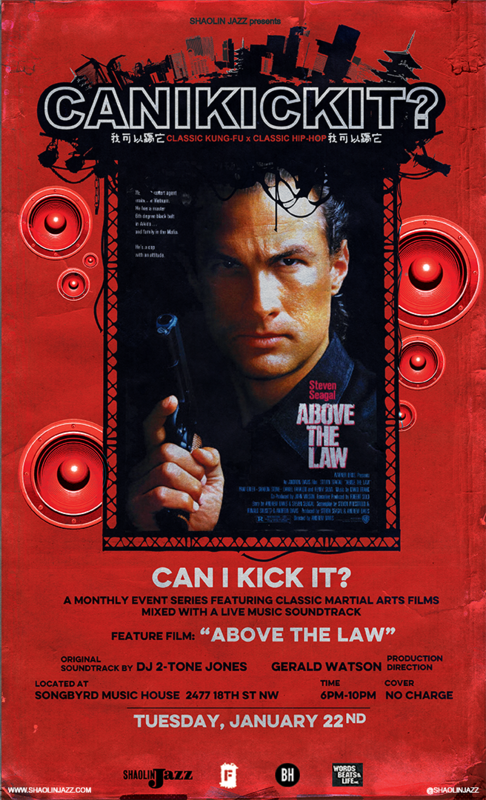 We’re pleased to announce that we’re back at Songbyrd Music House & Record Cafe for our next edition of CAN I KICK IT?, Tues January 22nd, where we’ll be screening “Above The Law”, 6 – 10 PM, FREE. And we’re also pleased to announce that we’ll NOW be conducting CAN I KICK IT? (movie and music) both upstairs and downstairs of Songbyrd, which includes dinner service, additional seating, a full-service bar, and a curated pop-up space. – DJ 2-Tone Jones scoring classic hip hop music!